Build your students' success with word problems with a problem of the day. 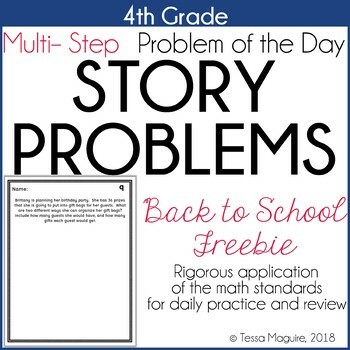 These 4th grade multi-step story problems contain rigorous, real-world applications of the math standards and are intended to be guided and independent practice activities with varying levels of difficulty. With daily, on-going practice with the standards spiraled throughout the year, students build their understanding of they types of word problems on state assessments and build their strategies, comfort, and mastery of the standards. Some pages can be completed by students independently while others are intended for students to use varying strategies to work through the problem, and then gone over as a class focusing on strategy use. Some word problems include many steps to reach the solution while others require students to explain their work. These free 10 pages are the perfect jumpstart to your Problem of the Day with review of the 3rd grade standards. You may not redistribute, edit, sell, or otherwise post this product on the internet. You may, however, post a link for others to purchase themselves.